@george1421 thank you. When i PXE boot the surface again with ipxe7156.efi and an active upload-debug tastk, it gets as far as in image 1. Network should be fine, I’ve done some imaging with desktop PCs with the same port. @Quazz I’m using an ethernet to usb adapter (offical from Microsoft). It’s new, bought 2 days ago. PXE boot the device. It should launch into capture mode and then after a few enter key presses it will drop you to a linux command prompt. This is the FOS engine command line. From there we can do some debugging like ip addr show Please post the output of that command here. 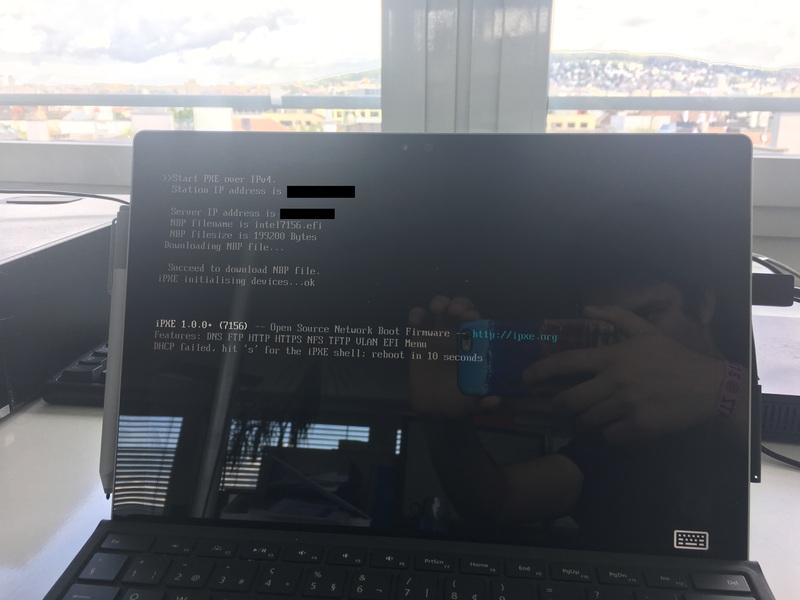 Also ensure that the network port this device is connected to has spanning tree turned off (not a good choice) or one of the fast spanning tree protocols enabled. (RSTP, port-fast, fast stp, etc). A quick test would be to place a dumb (unmanaged) switch between your building switch and the target computer. If you can pickup an IP address in this configuration you need to look into your spanning tree configuration on your building switch. 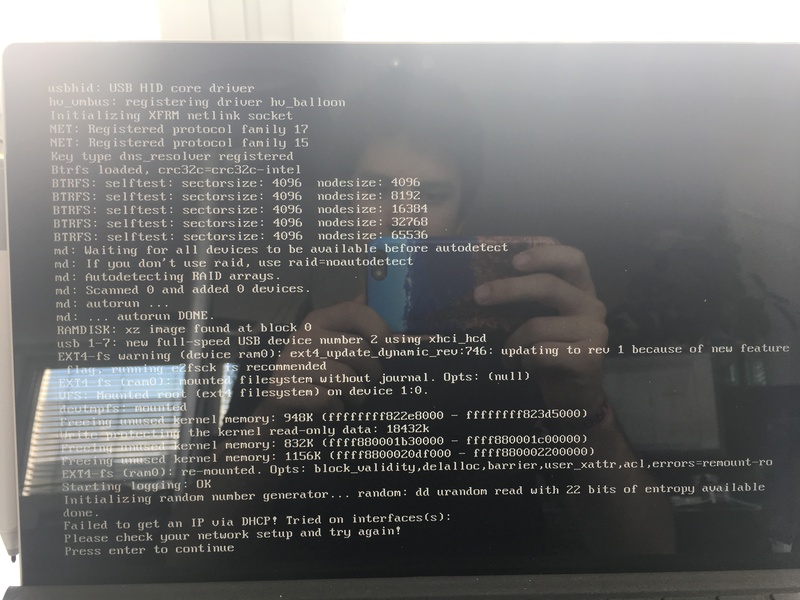 What happens when the FOG boots a target device is that as the target boots, it winks (monetarily turns off and back on the network link) as each kernel hands off to the next kernel (i.e. PXE boot ROM-> iPXE and iPXE -> FOS Engine). The issue is that if STP is enabled it takes STP 27 seconds to move from listening to forwarding. By the time the link moves to forwarding, the FOG boot process has already given up. I’m guessing the issue is due to the ethernet connection going through the keyboard dock thingy. has_usb_nic=1 I got Please unplug your device and replug it into the usb port. In both cases the keyboard is not regocnized and nothing happens if i press enter. This is primarily because I don’t have any of the surface pro’s myself, so I can’t tell if one file (or another) will or won’t work. The has_usb_nic=1 should only be required if you’re running a USB Nic, and that NIC is recognized, but unable to get an IP address. That said, I doubt this is the issue you’re having, just trying to help lead you in the right direction. This sounds, to me, that you’re not using the same files as suggested in the posts you’ve read thus far. In 1.3.0-RC-7, there are already files available for the Surface pro’s to boot from. They’re labeled in the /tftpboot/ folder and have the 7156 applied to the filenames so as to limit confusion of what they are. You should also try different files. If ipxe7156.efi isn’t working for you, maybe intel7156.efi or realtek7156.efi may work. There’s also the snp7156.efi and snponly7156.efi files. 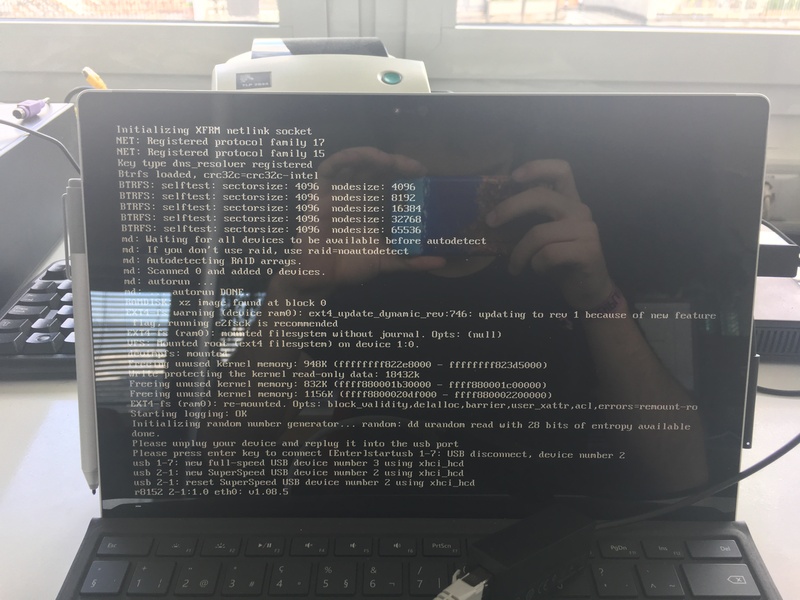 I don’t know why the surface’s have a hard time booting and I’m fairly certain its something with the drivers from the 7156 version through current but I have not been able to get to a solid method of testing to narrow exactly when the problem occurred. This is primarily because I don’t have any of the surface pro’s myself, so I can’t tell if one file (or another) will or won’t work.